Instrument Range: -40 to +450°F/-40 to +230°C. 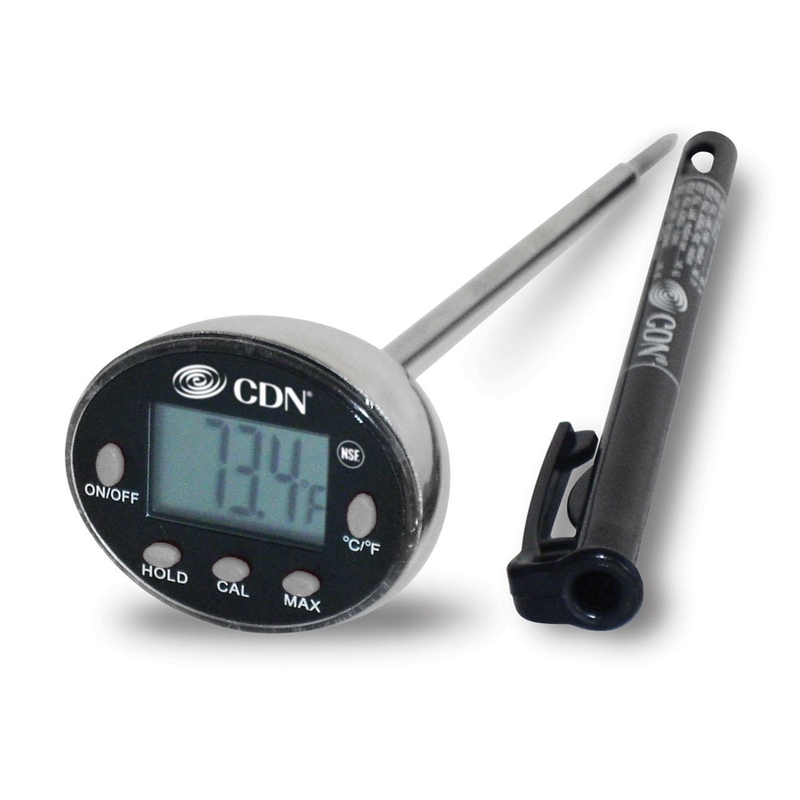 Press the ON/OFF button to turn the CDN ProAccurate Quick Tip Digital Cooking Thermometer on. After use, press the ON/OFF button to turn the DTQ450X off and conserve battery life. The thermometer automatically turns off after 10 minutes of inactivity. Temperature Scale Press the °F/°C button to select temperature reading in Fahrenheit or Celsius. Before withdrawing the thermometer from the food, press the HOLD button. This will "hold" the reading until pressed again. H appears in the upper right corner of the display. Press the MAX button to display the highest temperature detected while in MAX mode. MAX appears on the display. Press the MAX button for 3 seconds to exit MAX mode. Place the stem into at least 1 inch of crushed ice with water. Do not let the stem touch the bottom of container. Press the CAL button for 2 seconds. CAL appears on the display for 2 seconds, then 32.0°F appears. To avoid accidental recalibration, this function works only when the ambient temperature is 23 to 41°F. Clean the thermometer stem before each use. It's very important never to leave the thermometer in a hot oven or microwave. Meat should be allowed to "rest" for 10 to 15 minutes after it is removed from oven. This allows time for the meat's internal temperature to stabilize and the juices to redistribute. This will result in a roast that is both juicier and easier to carve.Five year limited warranty.